This is a wonderfully easy and less messy cake version of tarte-tatin. You don't even need a cake baking tin. You only need one bowl to mix the batter and one stainless-steel sauce pan to make caramel and bake the cake. There's less washing up afterwards. 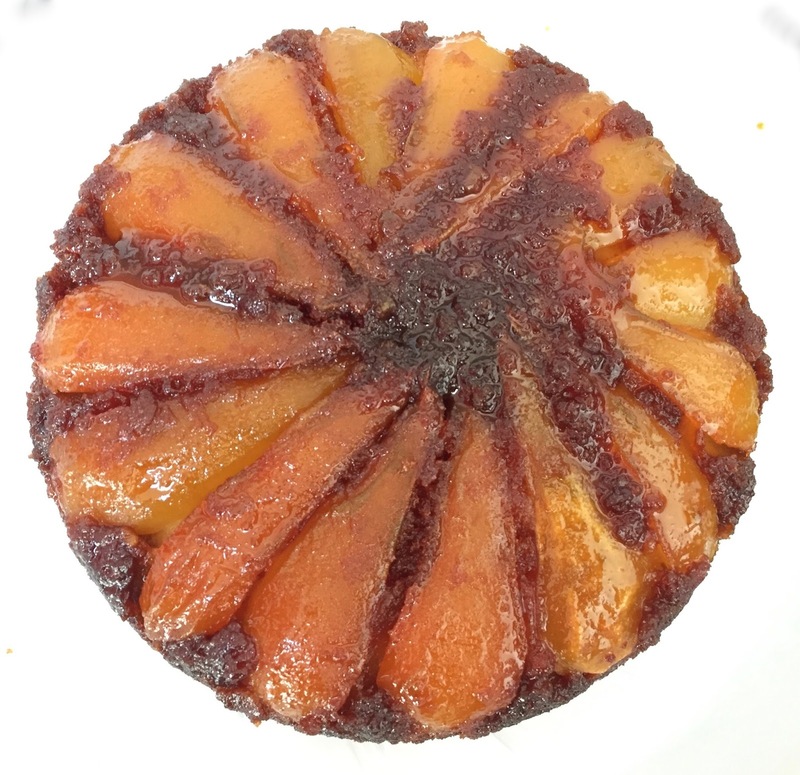 If you have baked tarte-tatin, you know how annoying it can be to clean the pan which is used for making caramel. Hardened caramel stuck to the bottom of the pan is really difficult to clean. However, I have noticed that the caramel which is baked in the cake tin doesn't stick as much as caramel made in the pan. So, here is the solution. Make caramel in the pan, place the apple on top of the caramel in the pan. Then pour in the cake mix and bake. 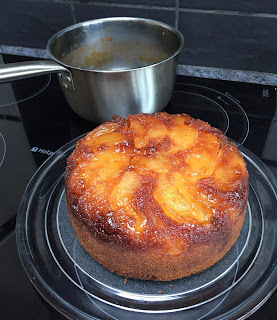 As a result, as the pan bakes the cake, there is no need to use a cake tin. AND, not surprisingly, the caramel in the bottom of the pan melts in the apple cake, and is SO easy to clean afterword. Ha! Isn't it a clever idea? Ah, I've just got another idea. I could sprinkle sea salt on top of the caramel before laying sliced apples. 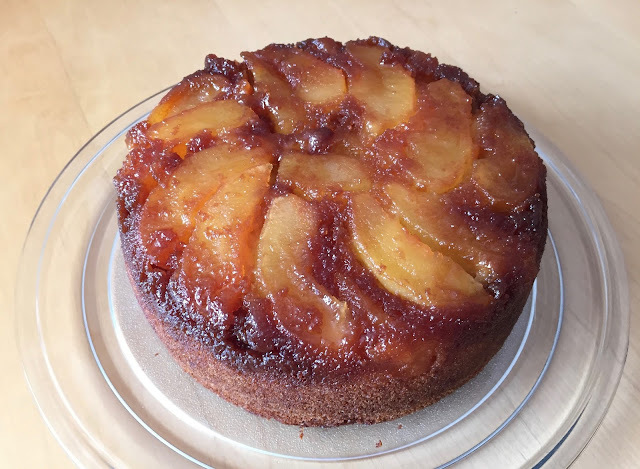 "Salted Caramel Upside-Down Apple Cake"...... sounds even more interesting??? Place the granulated sugar and 3 Tbsp water into a stainless steel pan. Stir over a low heat until the sugar has dissolved and there are no granules. Slice the apples and place them on top of the caramel layer in the bottom of the pan. Put all the ingredients of the cake mixture in the bowl and mix with an electric hand-mixer. Pour the mixture into the pan over the apple. Bake in a preheated (180 C) oven for 50 minutes or until golden brown on top. 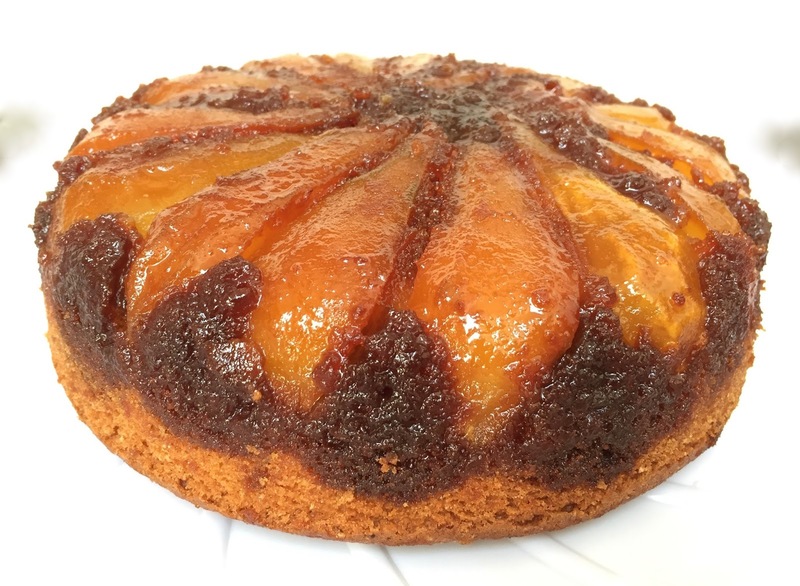 When the cake is baked, leave it for a few minutes then turn it upside-down onto a plate. Here is the "pear version"